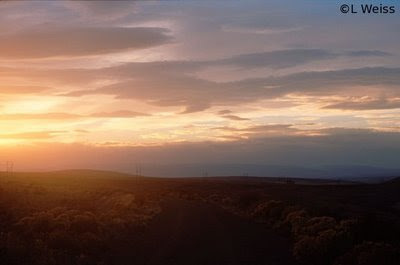 There was a time, not so long ago, out in the high deserts of Central Washington when the lonesome sagebrush and eerie sunsets weren't quite as alone. Nestled high above the Columbia River in a place named Boylston a railroad built a small station, planted trees, and went about the business of running trains to the West Coast. The station at Boylston was small and modest, like many others scattered along the rails of The Milwaukee Road. Old photos show Boxcab electrics and infamous Bi-polars climbing the grades here through the Saddle Mountains where Boylston marked the apex. Later photos show SD40-2's pulling hard up these same slopes, the electrification deactivated in the early 70s. The trees are bigger in these later photos and stand in obvious contrast to the desert landscape that surrounds them. This was an outpost on America's Resourceful Railroad, and much like the railroad itself, seemed to exist in spite of the obstacles around it. In the Pacific Northwest, the Milwaukee Road had an interesting collection of branch lines with equally interesting histories. Some were not connected to the rest of the system via Milwaukee rails, but with ferries. Among these isolated lines was the old Bellingham Bay and British Columbia. This was purchased by the Milwaukee to increase its footprint in the lush Pacific Northwest. The line operated 25 miles from Bellingham to Sumas on the border with Canada. Merger conditions that resulted from the Burlington Northern allowed the Milwaukee to do away with its car ferry and access these lines directly. Despite the light rail, this line was known to be home to some of the Milwaukee's heaviest diesel locomotives as the fleet wore down and the seventies wore on. It's a warm July day in the Idaho Panhandle. In the yards of the St. Maries River Railroad sits a collection of old cars that could easily be at home in a museum. Old snow plows are lined up with an old ribside caboose and Hiawatha baggage car that still faintly reads "The Milwaukee Road." A few ancient log cars are stored here in the yards as well. They're old beyond the point where interchange is allowed and are restricted to St. Maries track as a result.